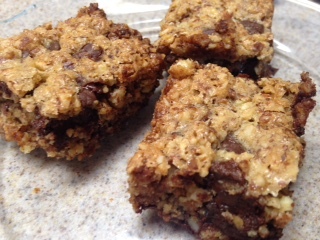 Well, these easy-t0-make bars really are, probably because they contain no matzoh meal or matzoh flour — not even potato starch! I got the recipe from a collection of Passover recipes that came into my email in-box; I apologize that I can’t credit the source. It’s one of the easiest recipes I’ve ever made, and it would be a great one to make with young children, who can dump the ingredients into a bowl and stir. And they’re gluten-free! The recipe says you can shape them into cookies instead of bars; I haven’t tried this. My own suggestion is to consider replacing the chocolate chips with Craisins or dried cherries — or add those in addition to the chocolate chips. The original recipe also called for a 9 x 13-inch pan. I used an 8-inch-square pan and it worked well; I think in a 9 x 13 pan the squares would be too short. I also changed the baking time and temperature slightly. Another bit of advice: the first few bars tended to stick to the pan, even when I greased it well — after the first few came out crumbled I was able to pry out the others intact. The second time I made this recipe I put a piece of parchment paper in the pan before adding the batter — and had no broken bars! Mix all ingredients together in a large bowl. The batter will be thick; do not add water or other liquid. Grease an 8 x 8-inch square baking pan and put parchment paper on the bottom. Or lightly grease a cookie sheet if you plan to make cookies. Spread the batter evenly in the pan or shape into cookies and place on the greased cookie sheet. Bake square pan for 30 minutes (cookies will take less time) until the top is nicely browned and the center of the pan looks dry; do not undercook. I think I told you awhile ago that I was part of a BzzAgent campaign on behalf of HemisFares brand pasta, available at the Kroger family of stores. They sent me a free sample of pasta so I could tell people how wonderful it is. 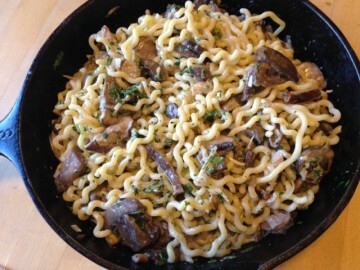 I promised another recipe using the pasta and here it is. I love the HemisFares fusilli bucati lunghi — it’s long strands of spiral pasta with a nice al dente texture even when cooked a little longer than the directions call for. I wanted to pair it with a fairly substantial sauce. 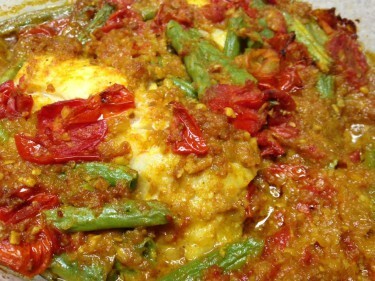 This is a very tasty and fairly easy recipe. The original sauce recipe said it made enough for a pound of pasta, but I used a half-pound, and there wasn’t a lot of extra! The original also called for heavy cream, but I used half & half. I also didn’t have shallots, so I substituted the white end of scallions. Melt the butter in a large, nonstick skillet over medium-high heat. Add the mushrooms, onion, shallots, garlic, 1 tsp. salt and peppr and cook for about 12 minutes, stirring occasionally, or until liquid evaporates and mushrooms are tender. Remove from heat. Add the cooked pasta, half & half, cheese and parsley, tossing gently to coat. Stir in the remaining ½ tsp. salt.